Champaign, IL – The Champaign Park District Board of Commissioners approved a Memorandum of Understanding among Champaign Park District, Champaign Parks Foundation, and Rainer and Julie S. Martens Foundation at a special meeting on September 27 to accept a donation of $4.4 million toward future enhancements at Human Kinetics Park. 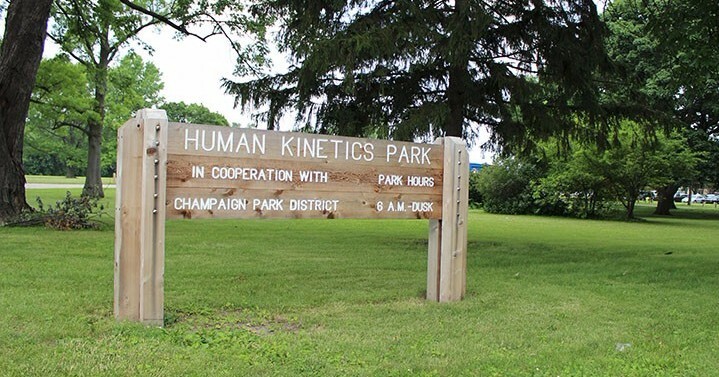 The gift, to be made by Rainer and Julie S. Martens, includes $400,000 for the purchase of the land leased by Champaign Park District as Human Kinetics Park. The remaining $4 million donation is intended for the development of a community center in the park for recreational, athletic, educational, and community activities. The facility will be named Martens Center at Human Kinetics Park for the considerable support of Rainer and Julie Martens and their donation towards this effort. Naming rights of rooms and amenities also will be made available to significant donors. “Human Kinetics, the publishing business we started in 1974, promotes physical activity and health worldwide. Julie and I are pleased to now have the opportunity to promote physical activity and health in our backyard by helping to build the Martens Center at Human Kinetics Park. We’re able to make this gift because of the many years of great support we’ve received by the Champaign-Urbana community and the outstanding employees who live here and have built a world renowned publishing company. We would like to especially thank Brian Holding, Human Kinetics’ long time CEO who is retiring in November, for being the “driver” in initiating the Center,” said Rainer Martens. Amenities being considered for inclusion are a gymnasium, meeting and exercise rooms, offices, and aquatics areas. The exterior grounds may contain playing fields, as well as a walking trail connected to the Boneyard Creek Development. The estimated cost to develop and construct a community center with the proposed amenities is $12 million (edited on 6/21/18). The Champaign Park District intends to partner with the Rainer and Julie S. Martens Foundation in fundraising for the remaining amount, as well as pursue local, statewide, and federal grants. The proposed center is planned to be the new home for the elementary after-school and the summer camp programs of the Don Moyer Boys and Girls Club. 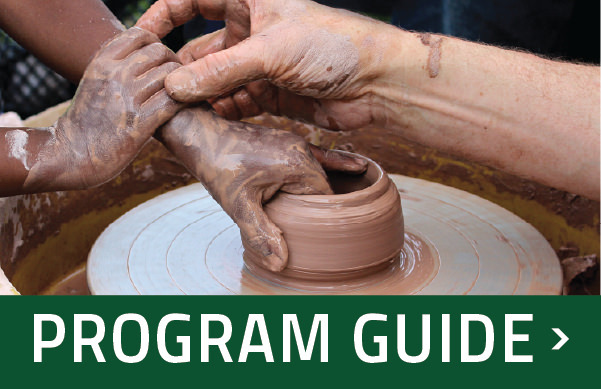 The move to the Martens Center will offer a great array of activities to children and also open up space at the club’s current location for programming for older students. The center will also be the home to the Champaign County Table Tennis Club as well as Champaign Park District programming. 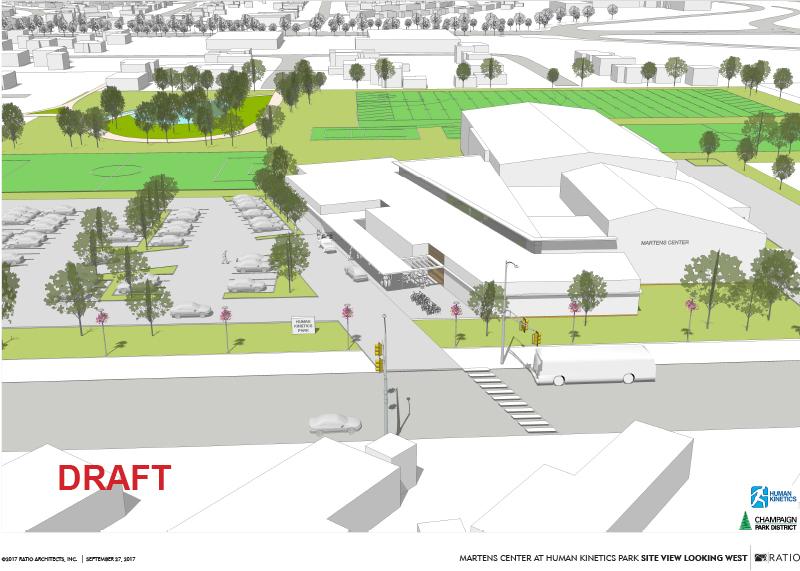 “Don Moyer Boys & Girls Club is excited to be a part of the plans for the Champaign Park District’s new Martens Center. It’s a wonderful opportunity for the Club and the Park District to come together in support of youth and families in the community who need us most. Rainer and Julie Martens have planted a significant seed to create a center that will touch many lives that currently may not be touched. The Boys and Girls Club hopes that others in the community will join them,” commented Sam Banks, Executive Director of Don Moyer Boys & Girls Club. Fundraising efforts are to begin immediately, with schematic designs being developed in January 2018 by Ratio Architects. Construction is scheduled to begin in April 2019, after all designs and bids have been approved. The Martens Center opening is tentatively set for May 2020. “The Champaign Park Board of Commissioners is excited to have this partnership come to fruition. Our Community is fortunate to have a family like the Martens and an organization like Human Kinetics who are so invested in the growth and betterment of Champaign. The Martens Center will make a big difference in our residents’ lives. We encourage the community to support and invest in this effort. We know the impact of this gift will be huge and are grateful to the Martens for this partnership opportunity,” remarked Craig Hays, President of Champaign Park District Board of Commissioners. The Champaign Park District will schedule opportunities for community input on this exciting new project. Input may also be submitted via the online form at champaignparks.com/contact or by contacting Champaign Park District Executive Director, Joe DeLuce (joe.deluce@champaignparks.com) or Human Kinetics CEO Emeritus, Brian Holding (BrianH@hkusa.com).